Many Bishop’s University students work part-time during the course of their studies to supplement their income. 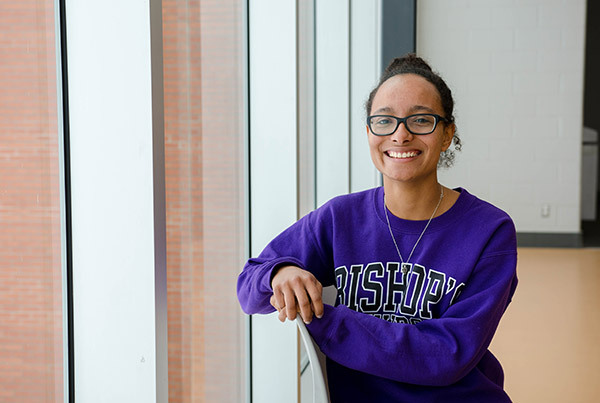 Aline Pierrisnard, a third year English and Sociology Major, tells us about the benefits of finding a job on campus. Looking for a job can be extremely stressful whilst trying to balance your school work and social life, but Bishop’s has you covered! Before coming to Bishop’s, I did not realize how easy it could be to work within the various departments that make up the university. What attracted me to a job on campus? On-campus jobs are convenient because, as the name suggests, they are on campus. Working for the University means no longer needing to factor in travel time between finishing your classes and getting to your job location. At most, it will take you ten minutes to get from classes to your job and then, once you’ve wrapped up your shift, you can head right back to class! This means, once you get to campus in the morning, you can attend your classes, study, meet with friends, and get paid all in a single day’s work! I now know so many more staff members and students that make up the University’s community, and I am happy to call them my co-workers and friends. Your studies still come first! The great thing about having a job on-campus is that your boss will recognize that, first and foremost, you are a student who is dedicated to your studies as well as your job! Your schedule will work around your classes, and if you cannot make a shift because you have other responsibilities, such as completing a paper for class, your boss will understand! This is honestly, so important! On-campus jobs are convenient, accommodating, and they are a great way to get involved in the Bishop’s community! Whether it’s working for Residence and Conference Services, Recruitment and Admissions Office, Advancement and Alumni Relations, Dewhurst Dining Hall, or the Student’s Representative Council (SRC), Bishop’s has a job for you where you can thrive and showcase your abilities!